0/3: Got this from one of my cigar smoking buddies; thanks buddy! This cigar is extremely long, is rather rustic looking with all those veins and bumps but it does have a pigtail cap and the wrapper covers the head. And there’s a little bit of oil on the wrapper. 1/3: Pretty strong flavors from the beginning: pepper and a general hot spice, some chocolate in the background. There’s also oak and wheat. Lots going on. 2/3: Oak and nuts are the big flavors during this third. Spice is gone and so is the chocolate (wheat is sort of still around). 3/3: Still tastes good with oak and nuts being the major flavors at the end. There’s a bit of spice coming back. 4/3: Medium bodied with a good draw and burn; this cigar is consistently good from the beginning to the end. PS: I have reviewed this line of cigars four times in the past: short robusto, corona and robusto (double review!) and the torpedo. All scored very well. 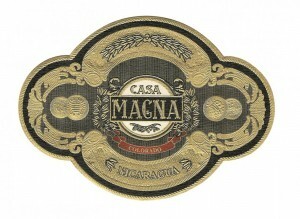 The Lancero by Casa Magna Colorado is a top 10 cigar for my money.